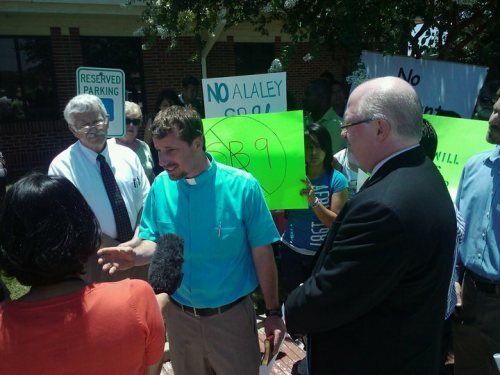 I was honored to be a part of a prayer vigil today, outside the offices of State Representative Solomon, in Carrollton. The reason was the possible reemergence of anti-immigrant legislation at the state level. It was a great honor to be with Owen Ross and approximately 40 persons, including six United Methodist ministers from around North Texas. b) Paul has done a very good job and says just about everything that’s also been on my mind the past few weeks. And while I’m not gonna write anything new, I’ve got lots of old posts that I’ve now tagged with “Because You Were An Alien.” You can find them here. Many thanks to all who came, for Rev. Owen Ross, and to Representative Solomon’s office for speaking with five of us privately to hear our concerns personally.